What is the most common symptom of scabies? The most typical symptom of scabies is intense itching, particularly at night. Scabies and its associated itching occur most often between the folds of the skin, such as at the wrists and elbows, between the fingers, and in the general area of the navel and beltline. Infants and children sometimes get scabies on the head and scalp, or on the palms of the hands or soles of the feet. Scabies is mainly transmitted from one person to another through close contact with an infested person, or by sharing his or her personal articles, such as clothing or bed linen. If you think you may have been exposed, or if you experience intense itching, consult your physician. Can you get scabies from pets? The human scabies mite infests and reproduces only on humans. Scabies mites from other animals may cause limited local irritation but will not become an infestation. Dark ink applied to skin areas of suspected infestation help locate scabies' burrow sites. To confirm the presence of scabies, however, your physician places a drop of sterile mineral oil on the affected area. A scraping from this area is then examined under a microscope. Why is it important to see a physician? Proper identification of scabies requires medical experience. Scabies is often accompanied by bacterial infections and is easily confused with other skin diseases. An accurate diagnosis is important because treatment for scabies requires the direct application of a prescription pesticide (scabicide) to the skin. Anyone of any age can get scabies, especially people living in crowded conditions. Can there be problems with treatment? Young children, nursing mothers, pregnant women, elderly individuals, and people with pre-existing medical conditions may be more vulnerable to scabicide treatments. Most problems associated with using scabicides occur when people do not follow product instructions carefully. Side effects are often associated with improper use and unnecessary overtreatment. Some treatments, however, are more risky than others. Are there treatments I should avoid? The National Pediculosis Association, Inc. (NPA) strongly discourages the use of scabicides that contain the chemical lindane. Lindane has been associated with a variety of serious medical problems, including seizures and cancer. Lindane products are available under various names, so it is important to check with your pharmacist about your prescription. Is there a safer alternative to lindane? All scabicides are pesticides and must be used with caution. Skin disease caused by tiny human itch mites . The presence of scabies mites is often indicated by tunnel-like lines of skin eruptions or bumps where female mites have burrowed under the skin to live and lay their eggs. Does the itching of scabies disappear after treatment? Itching may continue for as long as two to three weeks after treatment. But this is normal, and is not a reason to reapply the scabicide product. How do I treat the furniture and my home environment? Vacuuming is the safest and best way to prevent the spread of scabies from furniture and unwashables. Laundering bed linens, bath towels, and clothing in hot water is very important and should be a part of the treatment procedure. Avoid using potentially harmful pesticide sprays. Reports to the NPA continue to strongly suggest that prescribing a scabicide without critical evaluation can be counterproductive, if not harmful. It is unwise to treat for scabies (or any other disease) without a firm diagnosis because the person is not only exposed to unnecessary pesticides but is also delayed in getting an accurate diagnosis and proper therapy when scabies are not the culprits. Scabies can imitate many other skin conditions, such as insect bites, hives, eczema, folliculitis, contact or atopic dermatitis, impetigo, rosacea, psoriasis, lymphoma, and drug reactions. According to the American Academy of Dermatology, the most common test involves applying a drop of sterile mineral oil to the suspected lesion. The site is then scraped with a scalpel and the scrapings are transferred to a slide. 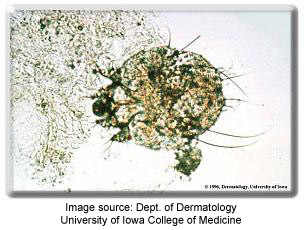 Under the microscope, the doctor should be able to find scabies mites, their eggs, or feces. Another option is an ink test, in which the doctor applies a blue or black felt-tipped pen to the suspected areas. Then the skin surface is cleaned. Mite burrows can be revealed if the ink sinks into them.